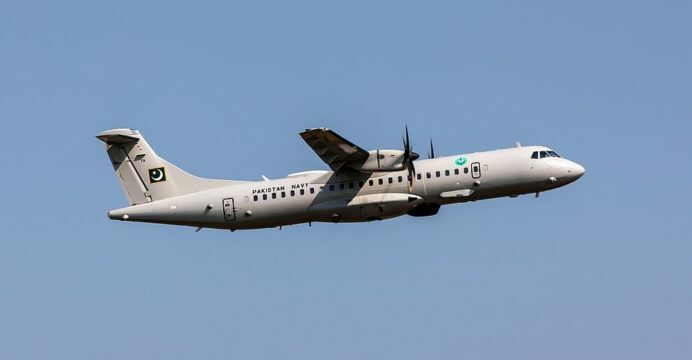 The Pakistan Navy received its first of two ATR-72 Maritime Patrol Aircraft (MPA) in the “second quarter” of 2018, announced Aerodata AG, one of the subcontractors involved in the program. “This delivery represents a major milestone for Rheinland Air Service as prime contractor and Aerodata as the key project partner,” said Aerodata AG in an official news release dated for 02 July 2018. Pakistan contracted Rheinland Air Service (RAS), an aircraft maintenance, repair and overhaul (MRO) firm based on Germany, in 2015 to convert two refurbished ATR-72s into MPAs. As per Aerodata AG, the work began in January 2016, following the release of export permits by the German government. Aerodata AG was contracted to supply its AeroMission mission management system, which will function in concert with the Leonardo Seaspray 7300E active electronically-scanned array (AESA) radar, Elettronica electronic support measures (ESM) suite, FLIR Systems Star SAFIRE III electro-optical and infrared (EO/IR) turret and anti-submarine warfare (ASW) capability through lightweight ASW torpedo compatibility. In addition, the ATR-72 MPAs were also configured with a self-protection suite providing defensibility to infrared, radar and laser-guided munitions. It also has passive electronic intelligence (ELINT) capabilities. In June 2017, Aerodata’s President and CEO, Hans J. Stahl, outlined that Pakistan will deploy its new MPAs for “maritime surveillance, anti-submarine warfare and also search-and-rescue” operations. In August 2016, the Pakistan Navy had received its third ATR-72, but it is unclear at this time if this unit is slated to receive the MPA upgrade. However, in 2015 the Pakistan Navy had reportedly requested $294 million US for the ATR-72 MPA program, potentially indicating that additional aircraft are intended. If sought to replace its aging Fokker F-27s, the ATR-72 MPA offers a substantially improved capability-set, not least from the fact that it has ASW capabilities and an AESA surface-surveillance, search and targeting radar. Interestingly, Pakistan’s ATR-72 MPA appears to share many of the same subsystems as Leonardo’s ATR-72MP offering, i.e. Seaspray 7300E, Star SAFIRE EO/IR and Elettronica ESM. However, Pakistan opted for the AeroMission mission management system instead of Leonardo’s ATOS. According to Aerodata, the AeroMission enables each human machine interface (HMI) console in the ATR-72 MPA to control all of the aircraft’s sensors. In addition, the AeroMission can compile feeds from each sensor to build a complete situational awareness picture for the crew and off-board assets (via network-enabled connectivity, e.g. tactical data-links). AeroMission includes a sensor fusion algorithm.